VMware certification roadmap 2015. VCP6 now requires two exams. VMware shows it’s certification roadmap for 2015 on it’s website. Each certification has a number in the name as seen in the past. Probably related to the fact that certification now expires. The VCAP Design and Administration certifications are now combined into a single VCIX certification requiring two exams (Design and Administration). VCDXs who want to earn multiple VCDX certifications only need to submit a new design that meets the certification requirement. No additional defense is required.For a multiple VCDX-NV certification, another defense is still requred. Two (instead of one ) VMware Certified Associate (VCA) certificati0ns for cloud solution track: VCA6-CMA and VCA6-HC . No information available yet on these two new certifications. 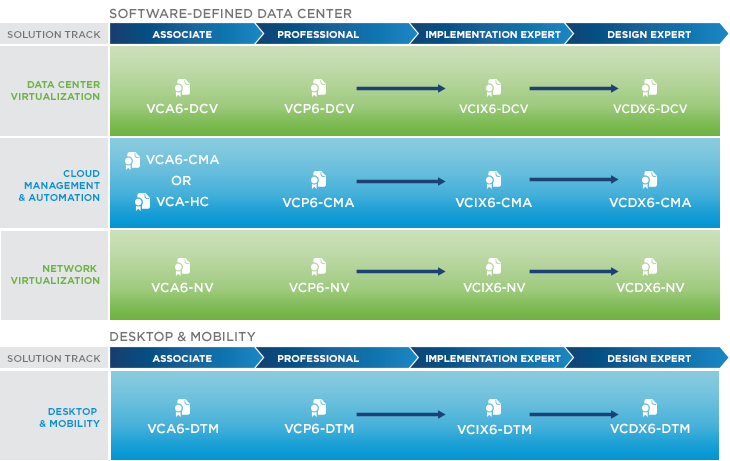 More info on the roadmap at the VMware Certification website. Chris Wahl wrote an interesting blogpost on the changes.